Today I am going to share with you details of body-care products that purchased from a brand called "I Love Cosmetics".These products are available in the Lifestyle Gulf stores.Read on to know more about the products! "I love... is a bath, body and beauty brand that lovingly creates gorgeous, deliciously scented products. Designed to cleanse, nourish, refresh and pamper your skin, our beautiful range is an everyday treat for anyone who just adores a delicousness! Mango & Papaya, Raspberry & Blackberry, Strawberries & Cream and Coconut & Cream are the tried and tested favourites but look out for our seasonal limited edition scents! We're always working on something new and super special for you all to try!" Let's begin with the haul! 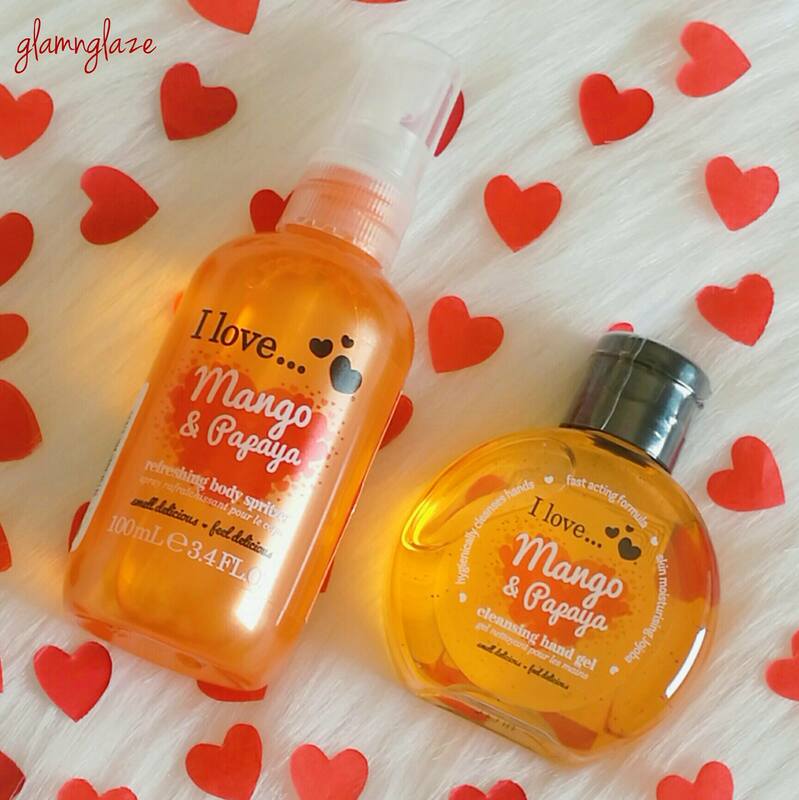 The first product is a body spritzer or a body mist in the Mango & Papaya variant. There are four variants are available.Coconut,Mango & Papaya,Raspberry & Blackberry, Strawberries & Cream. Ingredients: ALCOHOL DENAT., AQUA (WATER), PARFUM (FRAGRANCE), LIMONENE, BENZYL BENZOATE, HEXYL CINNAMAL, BUTYLPHENYL METHYLPROPIONAL, CITRONELLOL, HYDROXYCITRONELLAL. It's an amazing product.Summer season is around the corner and we all need to take care of our body.This body mist is awesome and it's effect lasts for about three-four hours.That's fine with me.The product smells delicious....yummy. Isn't the packaging cute(In Pic : above).I love the packaging and I am yet to try this product.Nonetheless,it smells divine! 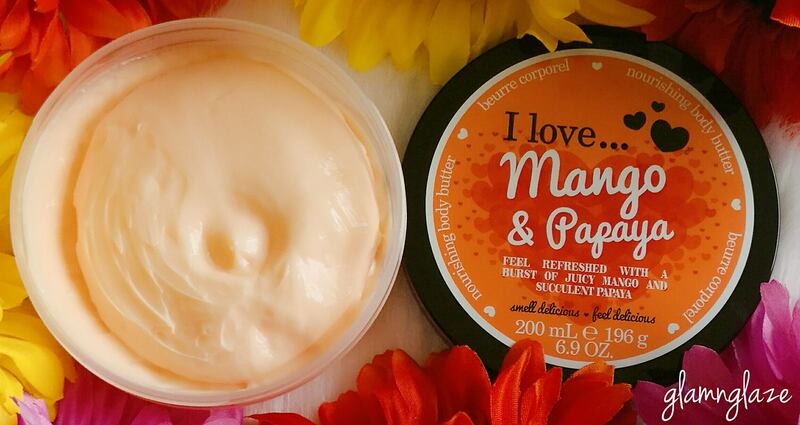 Third product that I picked is a body-butter in the Mango & Papaya variant! There are four variants available.Coconut,Mango & Papaya,Raspberry & Blackberry, Strawberries & Cream. Oh my god! I love this body butter a lot.It smells of fresh mangoes and papaya.Awesome fragrance,I must say. "Feel refreshed with a burst of juicy mango and succulent papaya.Coconut Oil & Shea Butter leave your skin feeling gorgeously nourished & silky soft, while my gorgeous perfume leaves your skin beautifully fragranced." The body butter is of orange-yellow-colour and the packaging is very good and sturdy. Love the tub-packaging of the product.Product is indeed moisturizing,but,you might get tempted to eat fresh mangoes...quite possible! The product has an amazing scent. Fourth & fifth products are from the Raspberry & Blackberry range. 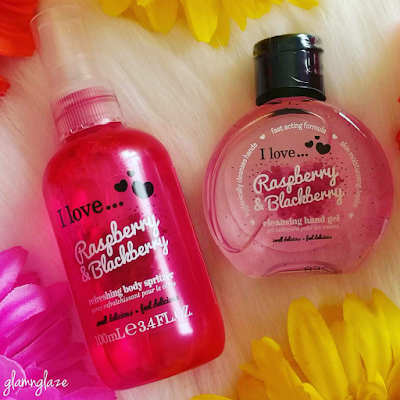 and the smell of raspberries...you will surely be smitten by the fragrance of the body-mist. Also,I tried the cleanser hand-gel or hand sanitizer and found it to be good.You can try it once. Squeeze a drop of the product into your palm and message gently.Allow the product to dry.No need to rinse. All the products come in a plastic-packaging which is of good quality and travel-friendly.Also,all the products are of good quality & affordable. 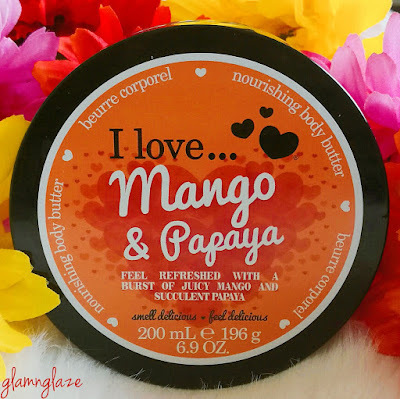 Products of I love cosmetics are awesome.I am in love with the body-butter from the Mango & Papaya range apart from both the body-spritzers that I purchased. Have you tried any product from I Love Cosmetics brand? What's your favourite product out of the products shown here? Did you like this haul?Do share.